Old Rosie – 55′ reverse style cruiser 2016 – is a lovely 55’ reverse layout cruiser stern narrowboat. 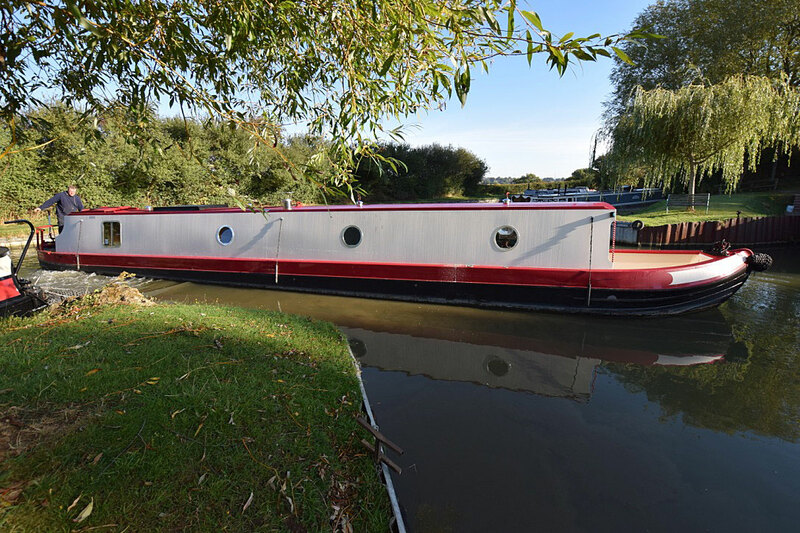 Having been built in 2016 by Nick Thorpe in Stafford, and fitted out very nicely by the original owner, the current owners bought her in June 2018, but have decided that they want a longer boat, so Old Rosie is back on the market. She is, as you would expect, in good condition. The stern deck is a large and social area at 7’ long, and has the Canaline 42 engine housed underneath. The steps down lead into the galley. It has oak floors and worktops and is a large and bright space housing the fridge, washing machine, 4 burner gas hob, oven and grill, a beautiful Belfast sink and plenty of storage. A huge sky light adds a feeling of space and light in here and a practical breakfast bar (with a wine rack set in) separates the galley from the living room. This is open plan and, in addition to offering space for a sofabed or two comfy chairs, has a solid fuel stove and a 20” flat screen TV set in a storage unit. The corridor on the port side has a side hatch opposite the sliding bathroom door. The bathroom is unusually large at over 8’ long. This is very nicely finished and has a quadrant shower, macerator pump out loo, ceramic basin and a stylish towel rail / radiator. The fixed double bedroom is in the forward cabin. The bed is 6’3” long x 4’ wide, and has six storage drawers under. A large wardrobe sits at the foot of the bed with drawers under and a shelf over, and there is further storage under the steps to the well deck. The well deck is nearly 6’ long. She has LED lighting throughout, Eberspacker central heating, an immersion heater, a 3kw inverter. She also has wiring in place for solar panels & satellite. Old Rosie – 55′ reverse style cruiser 2016 – A lovely boat, ready to go.